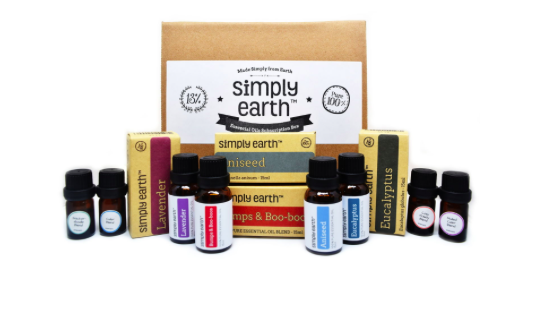 I was recently sent a subscription box from Simply Earth to check out and I want to tell you about it and what I received. This is a monthly subscription box where every month you get in the mail a box with different essential oils, recipe cards and containers to store your home made blends and recipes. Everyone knows someone who is crazy about essential oils and I immediately thought this is a great gift idea. I love monthly box subscriptions and this is one that I would love. Everything is 100% natural,no fillers or additives. Each month is different theme of 6-7 essential oil recipes and all the ingredients to make them. If you were to purchase these blends separate it would easily be over $200.00 but this box is only $39.00 a month. They also have different plans where you can get one every 3 months instead of every month or you can just buy one month. Below is a quick unboxing video I did to show you what was in my box.